4C's has it, and yes it's on the Golden Highway. DOOL for Days of Our Lives, I mean Boring. McDonald Carey famous saying "Like sands through the hourglass, so are the days of our lives"
Wonder why Sandy Hollow needs a double shed bus stop? I doubt the school on the right out of the picture would require a double shed for a bus stop. Where is this Punchbowl Bus? I apologise for the previous photo. lay up prior to going into the interchange for their next trip. Sorry all - open floor. the bus on the left is turning into western shops heading towards kurri/maitland the other bus heading towards neath & Cessnock! Okay where is HPC 402? 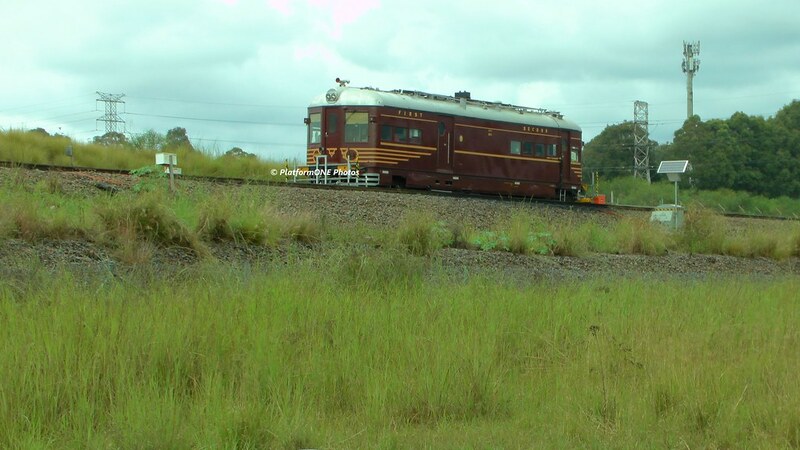 Since there was no answer, it's HPC-402 at Oakhampton Level Crossing. Sorry about that, I clicked on that "new" Bump Topic option at the bottom. Since I did that, where is this TV-6867 Mercedes-Benz bus? What, no one wants to have a go? Clues: It's a "hot hot" town, so much so that you may need to REPEAT having a drink of water to relieve that "fire feeling" after some food. You're correct. Just because you live over "there" doesn't mean you can't post a where is, if you have a picture from NSW. Which station, and which platform? Lunch Box, you should've covered up the name of Town Hall! Forgot to say even if the name wasn't there on the escalator, it has to be Town Hall, as it's a straight platform edge. Wynyard has an island platform with one side that curves, and the straight platform passenger area is too narrow for Wynyard, St. James & Museum between the platform edge & escalators. Along with the two names on the name board, of almost the same length, unlike Circular Quay or St. James. NF, you're right of course. Incidentally, its Platform 6, and the pic is from March 2011. I think it looks substantially different now. The long decommissioned Balmain power station. (That looks eerily familiar). The former White Bay Power Station as that's the one associated with Sydney's "proper" pre-1961 tram network. The former White Bay & Balmain Power stations were not the same. Lunchbox, you do know it was my go since I got it correct?